Who’s your MAC daddy now? The Kent State Golden Flashes posted the biggest win in the 90-year history of the football program on Saturday, beating No. 15-ranked Rutgers on its home field. The win is Kent’s sixth in a row – the program’s longest in-season win streak in 72 years. It is also the Golden Flashes first ever win over a ranked opponent, breaking an 0-22 streak against Top 25 teams. “That was a big win against a tough opponent,” said Kent State coach Darrell Hazell. “Our kids prepared like crazy this week. We made enough plays early to keep their team off balance. Rutgers kept fighting back, but our guys kept fighting them off. 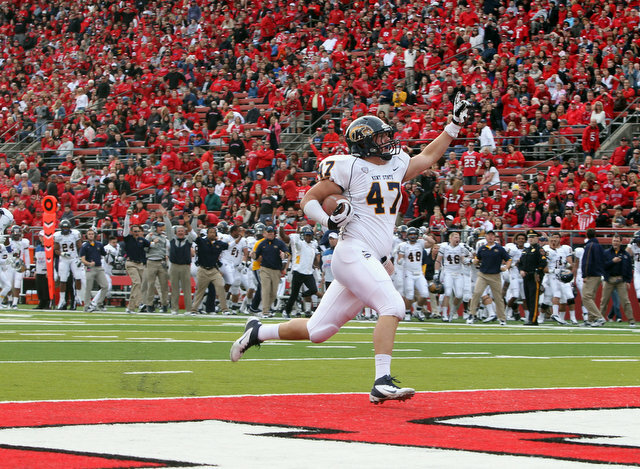 That they did as the Golden Flashes intercepted Rutgers quarterback Gary Nova six times and recovered a fumble. The biggest turnover of the game may have been Mark Fackler’s interception in the second quarter that he returned 25 yards for a touchdown. That put Kent up 14-3 which soon became 21-3 after a Dri Archer seven-yard touchdown run. Rutgers came into the game with the third-best rush defense in the nation, giving up just 69.1 yards per game. But they hadn’t faced a duo like Archer and Trayion Durham. Kent ran for 224 yards on the day, with Durham going for 131 yards and a touchdown (his eighth of the season), while Archer added 79 yards and a touchdown (his ninth rushing touchdown of the season). The win leaves Kent at 7-1 on the season and, with Ohio losing to Miami on Saturday, the Golden Flashes sit alone at the top of the MAC’s East Division. Adding a win over a Top 25 team also helps Kent’s chances of making its first bowl game since it played in the Tangerine Bowl in 1972. While this win is not on the same level as the men’s basketball team coming within one game of the Final Four in 2002 or the baseball team making the college World Series this past summer, it is awful close. Football at Kent State has been an afterthought for decades as the program cycled through coaches, losing seasons stretched out as far as the eye could see (the program once lost 21 games in a row from 1981 to 1983) and nothing ever seemed to go right. But that has all changed under Hazell, who now has a signature win to hang his hat on. Trust us coach, you’re not the only one.